The 2018 Kincardine Old Boys & Girls Reunion committee is hosting a 'Reunion Launch Party' next year on Saturday August 5th at Reunion Park featuring David Wilcox. The KTA will be showing their support for the event and the Reunion by volunteering to help pull off this event (i.e. set-up, take-down, bartenders, etc) The KTA is seeking out trail volunteers and enthusiasts alike to help out with this venture. 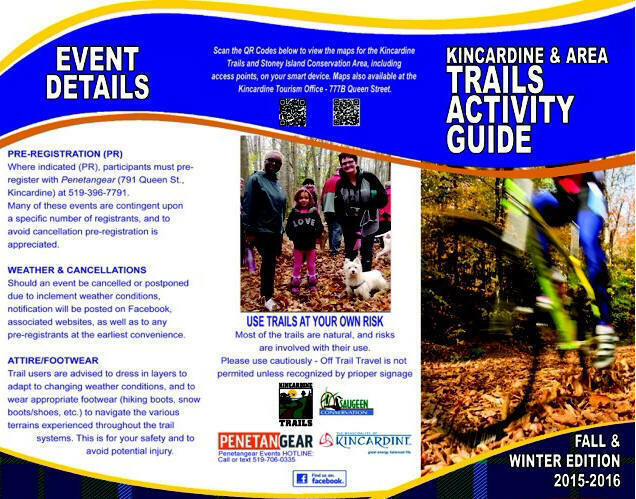 SO, if you can spare 2-4 hours or more that weekend please email information@kincardinetrails.net and provide the following info; name, email, phone and Smart Serve # (if you have training). The Reunion Committee will be offering Smart Serve training courses + you can also do it on-line. 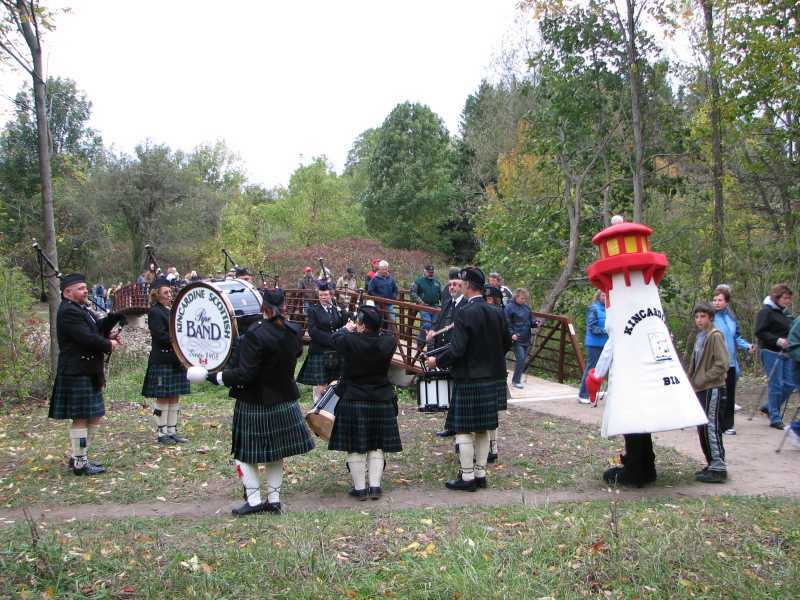 The Kincardine Old Boys & Girls Reunion is something all current and former residents look forward to and it takes many volunteers to ensure it is a successful and fulfilling event. 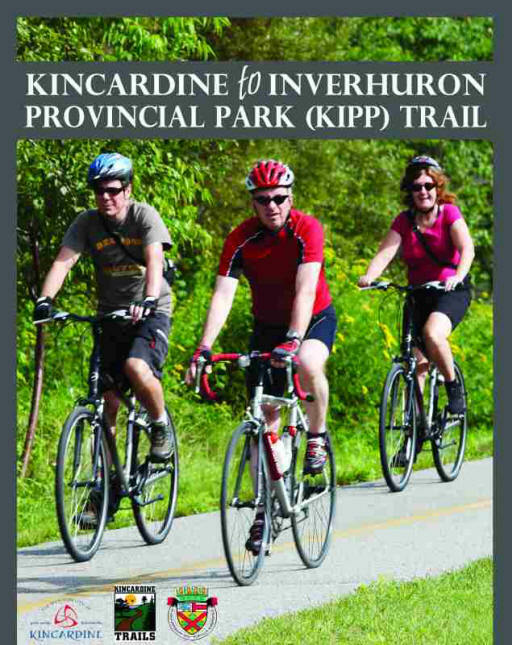 Hey Kincardine Trails peeps - let's do our part to make the Launch Party a huge success!! A Grand day for the trails indeed!! Picture of the new bridge and approaches installed at the east end of the red trail. I would be remiss not to give a HUGE shout out to my right hand trails partner of the past several years - Trails Manager Al Jamieson. Al is a founding KTA member and has now shifted positions to the Equipment Manager portfolio. The KTA now has some BIG shoes to fill in the Trails Manager position. Al has been an indispensible asset to myself and the trials organization. One could not likely imagine how much time is spent working on trails that is not the physical type. We do it because we enjoy it and take pride in the achievements that come along as a result of the time and effort put forth. Excellent effort Al, be proud of your valuable contributions and hope you enjoy the promotion! Finally, many thanks to you, the KTA Committee and volunteers who stepped forward to make a difference in our community, well done!! 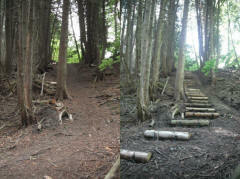 August 20, 2012 - New Green Trail Steps. For those of you that have entered the trail system of the north end of Fraser Drive you will have noted that it you immediately turn left/west that there is a steep slope down to the lower Green Trail. Not any more thanks to the efforts of Jamie Hunsburger and Lloyd Phillips as they have installed a set of steps from top to bottom! 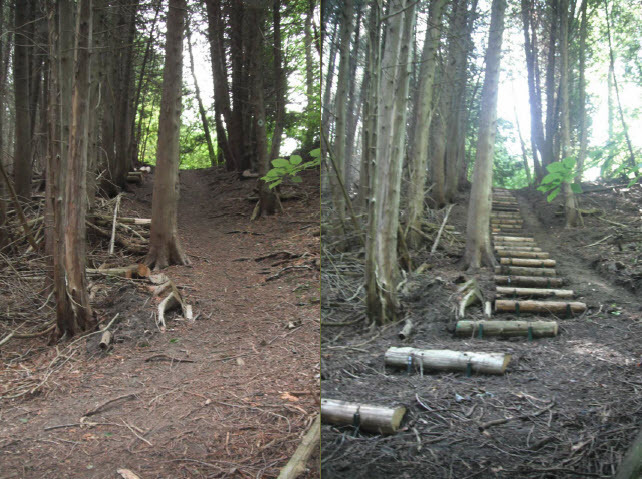 I had some visitors form Alberta out on the trails yesterday and made a point of taking them to view the new stairway and must comment that they look EXCELLENT and they will no doubt be much safer to use, especially after a rain. 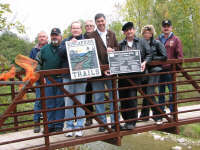 April 24, 2012 - Thanks to the many hands that helped out today (including a gang from the Public Works department) the Red-Green trails connector bridge has been re-installed. Just in time two as two young ladies did the (re? )inaugural crossing about 10 minutes after it was completed! April 24, 2012 - Brad and KTA members. It's great that the bridge will be re-established so quickly. I took about a dozen of my relatives, young and old, for a hike down to this river crossing at Easter before the bridge went in. They were impressed to see the suckers and mullets in the river. They were also impressed how they could get there with the walking paths and ease of getting through the wooded area. 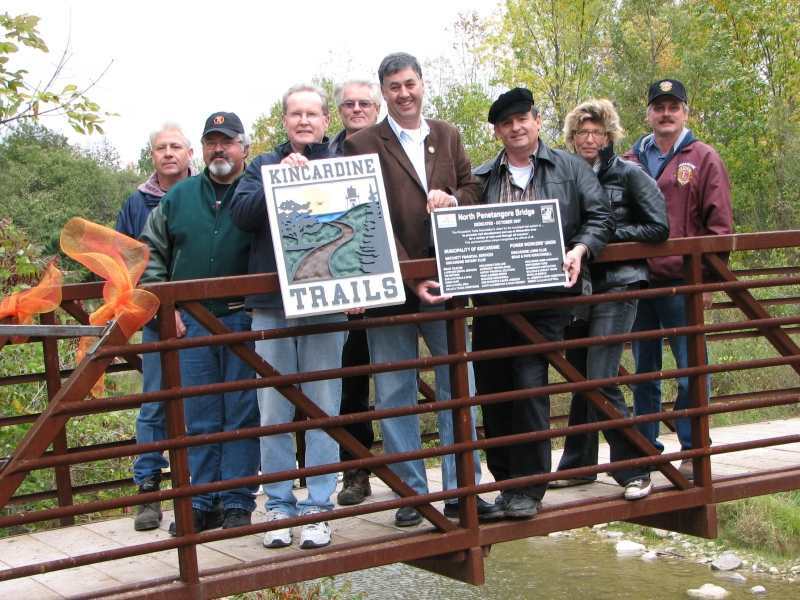 It was great to have the Kincardine Trails from the Hunter Ridge subdivision so that my father's siblings and their family could experience the nature that the Penetangore River valleys right in the town of Kincardine has to offer. The walk was much better than a post-Easter meal mid-afternoon nap. (my Uncles are prone to this). Most of my relatives don't have nature trails like these easily available where they live. One of my uncles asked if we were still in town limits or in the country. Keep up the great work; the Hedley family was really impressed with the outer reaches of the trail system by Hunter Street. April 22, 2012 - The Red-Green Connector Bridge. The entire structure of the subject bridge was tipped over on its side sometime this Sunday pm. The local newspapers were advised prior to their weekly deadline and I am about to report it to the OPP. Anyone hearing of any information as to who might be involved in this act of vandalism should contact myself or the Kincardine OPP. There is a need to secure young healthy backs to assist in putting it back into place, if you know of anyone willing to help out pls have them contact me directly. 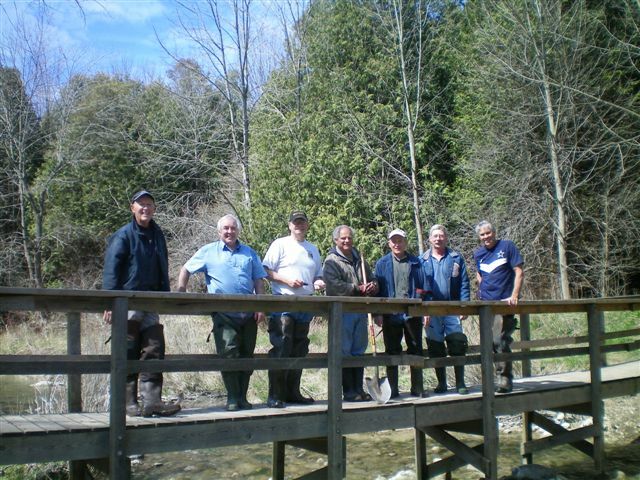 April 18, 2012 - The Red-Green Connector Bridge was installed for the season by Kincardine Trails volunteers, Brian Rhody, Al Jamieson, Bill MacTavish. Lloyd Phillips, Norm Gauthier, Bob Urie, Lorne Seal and Brad Kirkconnell. 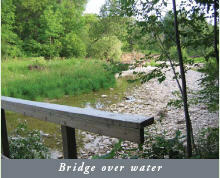 Sept. 21, 2011 - Agreement gives KTA access to river property. 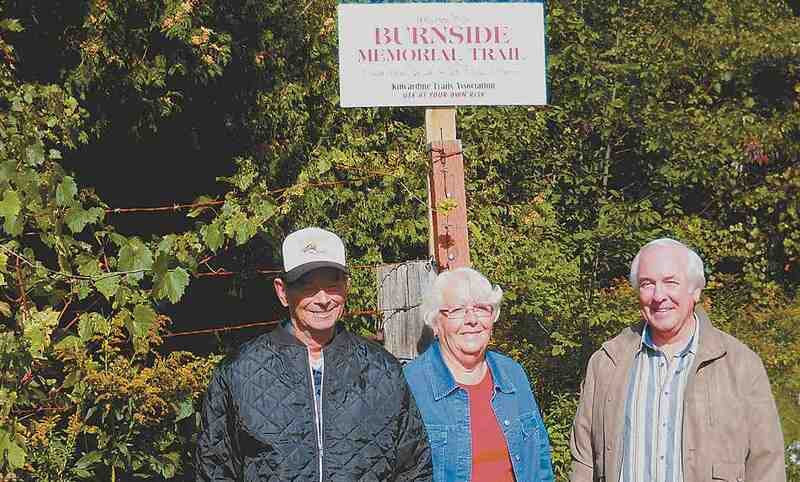 The Kincardine Trails Association hopes to find more land owners like Wib and Helen Burnside. It's taken 2+ years to come up with the funds but thanks to the generous sponsors and the municipality the long awaited installation of the Adelaide St Bridge is in the making! The footings were poured today, the weirs are going in on Thursday and the bridge structure and related work will happen early next week. I'll keep you posted on the timing of the bridge placement so you can attend if possible. 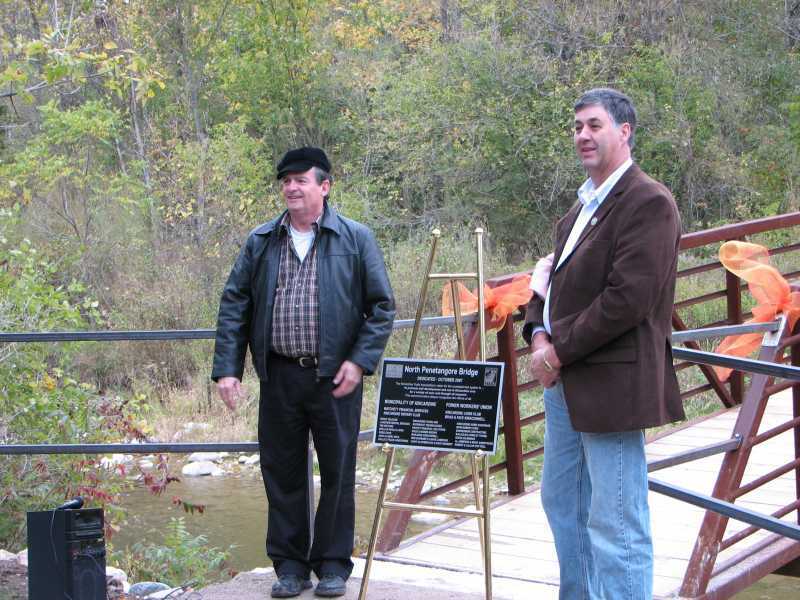 An official 'bridge opening' ceremony will be scheduled in the near future. On another bridge related matter - after being washed out by high waters for the second time this year the Red-Green Connector Bridge was re-installed again this morning. Many thanks to the volunteers who put this important trail link back in place! June 15 , 2010 Many thanks to the gang that was out yesterday (Tues) that fished the Red-Green connector bridge out of the river, repaired it and then put it back in place. We all know this is a much used link in the KTA system so it's great to have it functional again. 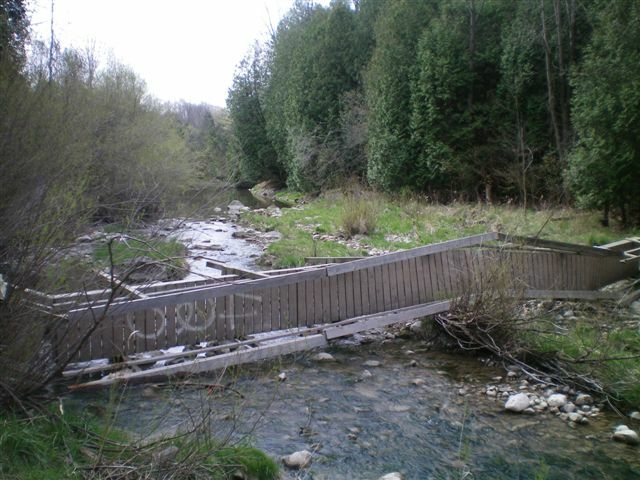 Most trail users will have noted the missing bridge on the Adelaide St road allowance, between Kincardine and Bruce Aves. The bridge that was initially in place there was of a temporary nature and was unfortunately washed down stream twice over the past 3 years. In the spring of 2009 it was damaged beyond repair. It has been the plan all along to replace this temporary structure with a permanent one. 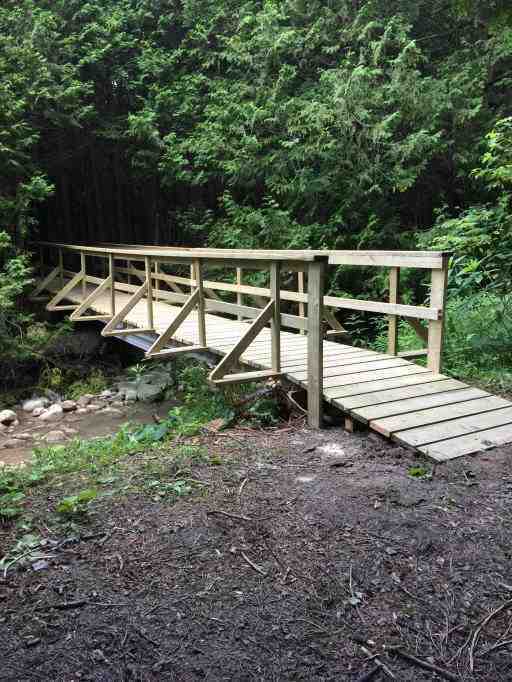 The Kincardine Trails Association (KTA) has been working with the Municipality, an engineering firm and SVCA over the past two years in an effort to wrap up all the details required for the installation of a permanent structure. The update on this project is that all of the engineering work and approvals have been completed. The actual bridge structure has been built and is in storage. We now await funding for the rest of the items required to put it in place (i.e. 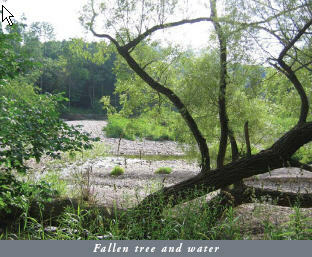 excavation, weirs, craning, etc) at an approximate cost of $20,000. The KTA was hoping this amount would have been made available in the 2010 municipal Capital Budget but with all the cuts that had to be made to reduce the tax increase this item was one that was not funded. 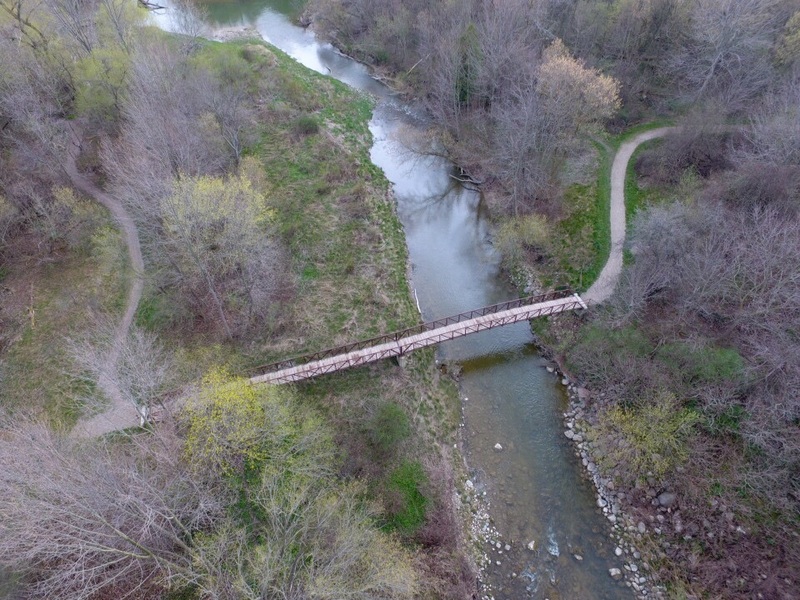 The KTA also depends on generous donors to help with the improvements and extensions of the trail system and we are happy to report that $10,500 in donations has been received towards the Adelaide St. bridge project. 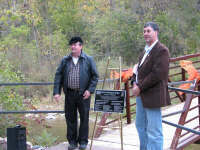 The KTA will continue to fundraise and work with the Municipality in an effort to have this bridge put in place in 2010. Any financial assistance you, your business or your family could contribute would help in offering the youth of Kincardine a safe route to the Legion Ballpark, municipal soccer fields and other area trails. 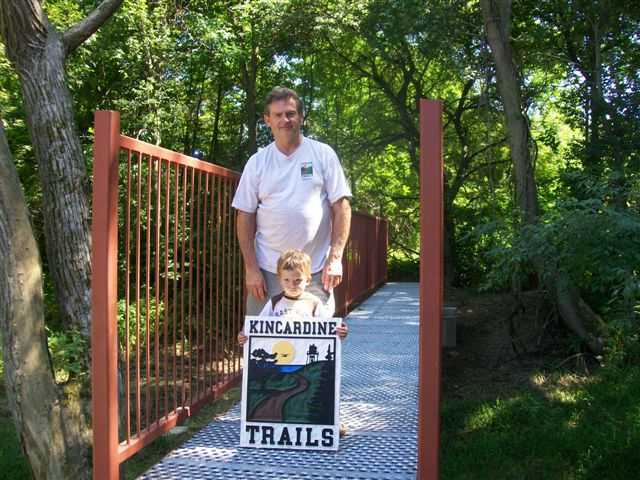 As a final note the KTA would like to offer their gratitude to the neighbouring Small and Catto families who have volunteered their time and equipment over the years for maintaining the trail approaches to the Adelaide St bridge. 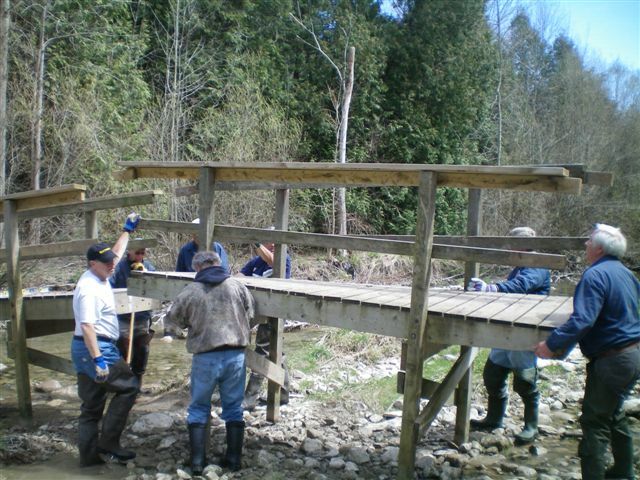 The municipality continues to be a great advocate of trail development but at the same time the KTA also depends on volunteers to maintain current trails and assist in developing new ones. To volunteer go to kincardinetrails.net or call Brad at 396-8028. June 6, 2010 The Red-Green connector bridge was damaged in the last storm and will be unavailable until the water recedes and repairs are made. May 17, 2010 The trail at the Davidson Centre was cleaned up today. Work included removing fallen trees, relocating a section due to a wash-out and a general raking. 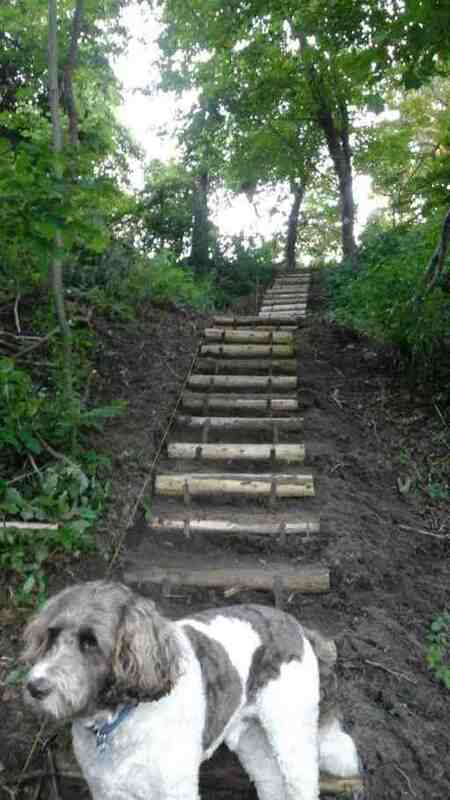 A trail friend has adopted this section of trail for 2010 and will inform the KTA if there is any work required on it. Assistance will be required to level mulch on the lower section of the Red Trail at Geddes Park. 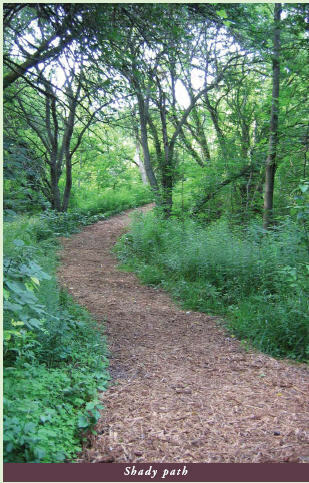 Once the municipality has dumped mulch along the trail we will notify you of the date and time that the spreading of the mulch will occur. Slope Work: A gang was out today to clear the slope immediately south of the Scott St pumphouse down to the S. Penetangore River. The north slope was cleared last fall. There is now a nice sight line from either hillside to view the bridge once it is in place. The KTA may build a viewing platform on the top side of the south slope once the area has been cleared of landscaping trash that has been deposited there. Geddes Park: was also cleared of fallen trees today. 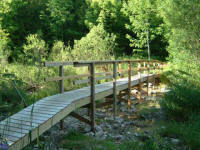 The mulch on the lower trail will need to be replaced this year. Volunteers will be required to level piles of mulch around. S. Penetangore bridge: work will not happen this year unless a significant donor comes along as the required funds did not make the final cut during the 2010 municipal budget deliberations. 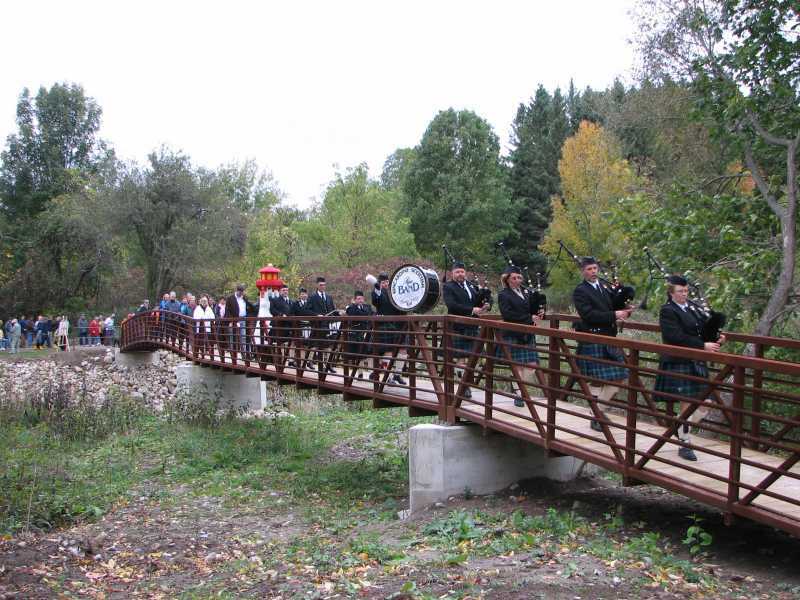 For the first time NO Capital funds are available for the KTA this year but there are still hopes that we will find enough funds to install the Adelaide bridge (between Kincardine & Bruce Avenues). Trail Inspection: As of this year all trails under the KTA must be inspected annually and any deficiencies noted and reported to the municipality. 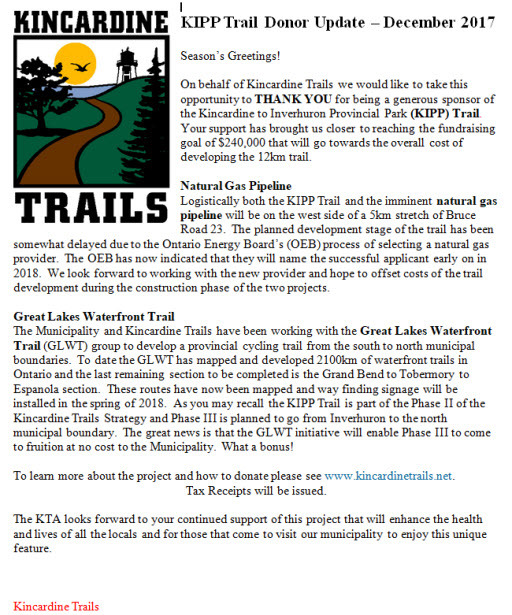 Trail marking: most to all of the current KTA trails require their trail markings to be renewed. 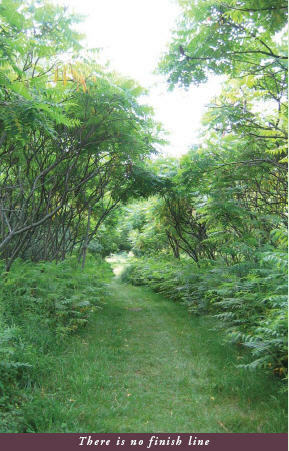 Some trails have not been marked to date so they also need to be done in 2010. The current markings consist of a painted triangle on trees etc. Markings going forward will be a simple paint swatch (stroke of a brush). This something that a volunteer could do on their own so let me know if you'd like a brush and a can of paint to help really dress up your trail system. 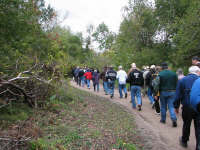 Trail Adoption: If you adopted a section of trail last year and are willing to continue pls let me know by return email. If you would like to adopt a section let me know your preference by return email. To clarify, adopting consists being the 'voice/face' of the KTA on the trail + clearing small debris and advising the KTA of any other deficiency that requires the use of equipment. leading visitors over the new bridge. 1. Curb vehicle exhaust emissions & reduce air pollution. 2. 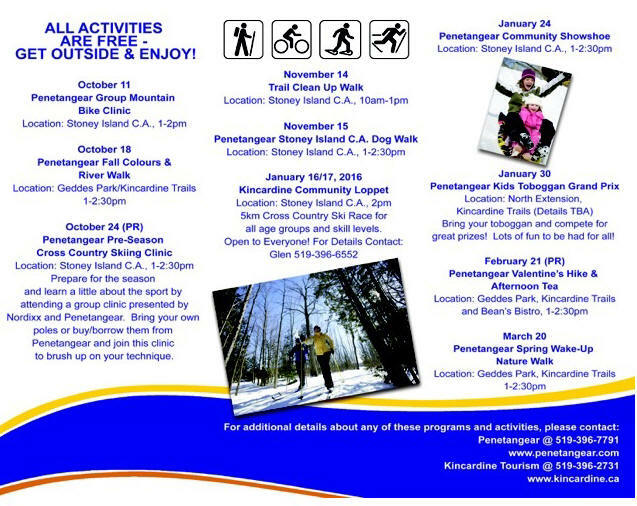 Encourage seasonal walking, hiking, cycling, birdwatching, photography, cross country skiing and snowshoeing. 3. Allow young people, particularly south side residents, safe and healthy access to the public schools, the high school and the Davidson Centre. 4. 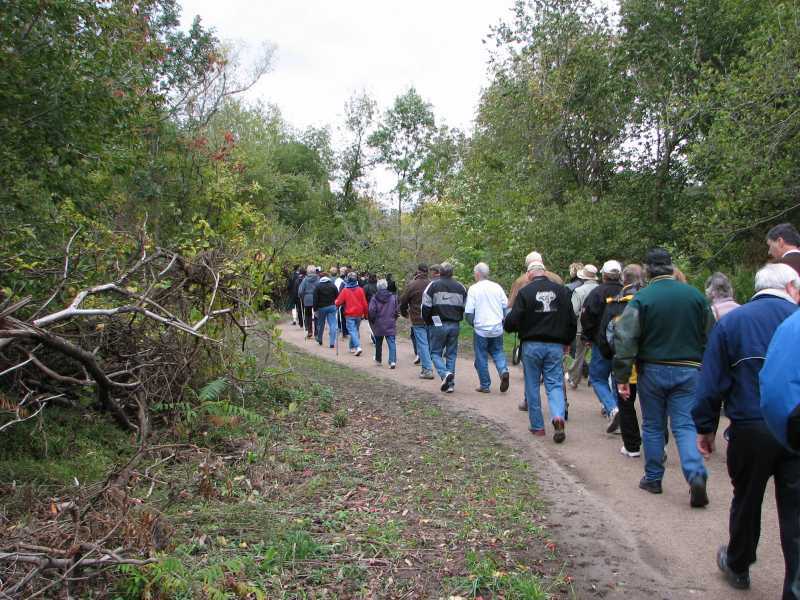 Provide safe and healthy options for seniors on sections of accessible trails. 5. Promote wellness and a healthy lifestyle. 6. Lessen the number of bicycles on vehicle roadways and thereby reduce the risk of vehicle-bicycle accidents. 7. Permanently connect the trail system making it a truly four season trail. Our current trail system functions for only six months of the year. 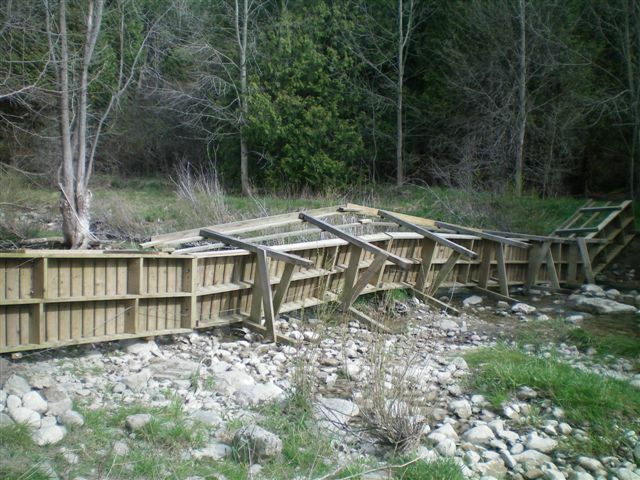 Because two temporary bridges must be removed from key Penetangore River crossings in the winter months to prevent them from winter ice and spring floods, we are now launching a campaign to make the wooden bridges permanent ones. 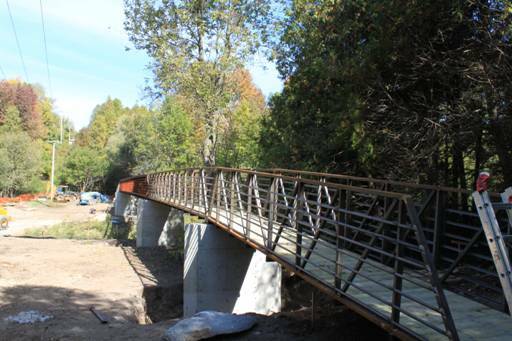 Permanent bridges, spanning the North and South Penetangore River, will also reduce the environmental impact on the river and associated wildlife by eliminating the need to install and remove the temporary bridges each year. 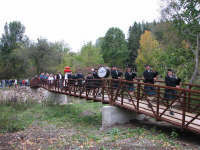 Our goal is to build the first of the two bridges by July 2007 and have the second in place in time for our Old Boys and Old Girls Reunion in 2008. The projected construction cost for both permanent bridges is $250,000. The Municipality of Kincardine is supporting the KTA vision. In turn, we have committed to fundraising $30,000. Choose the amount of the donation you want to make from the categories listed below. We will issue charitable donation receipts for the full amount. Have your family orbusiness name listed on our KTA website and recognized in local media coverage. Everything listed above, plus your family or business name on the bridge building commemorative plaque. 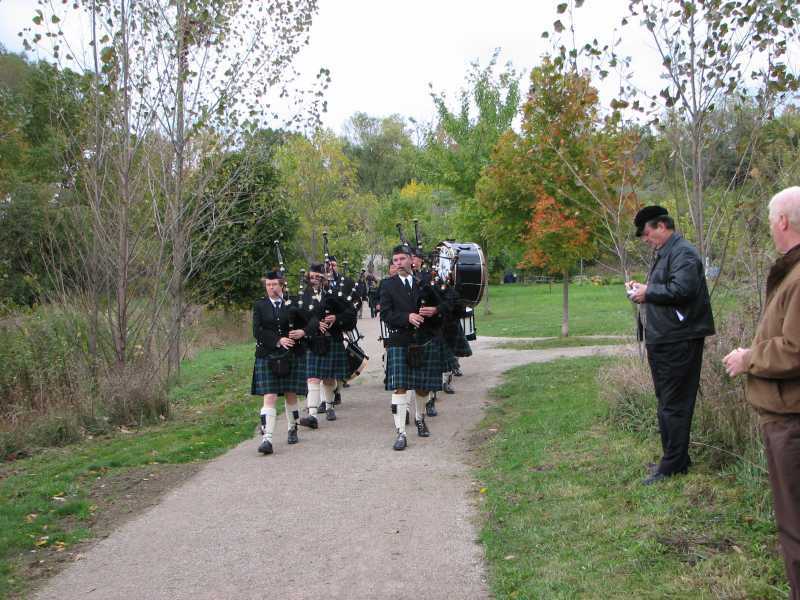 All of the above, plus your family or business name noted in our annual trails brochure for two years, plus a published group picture from the commemorative bridge opening. All of the above, plus your family or business name noted in our trails brochure for five years, plus a framed recognition certificate. re q u e s t .